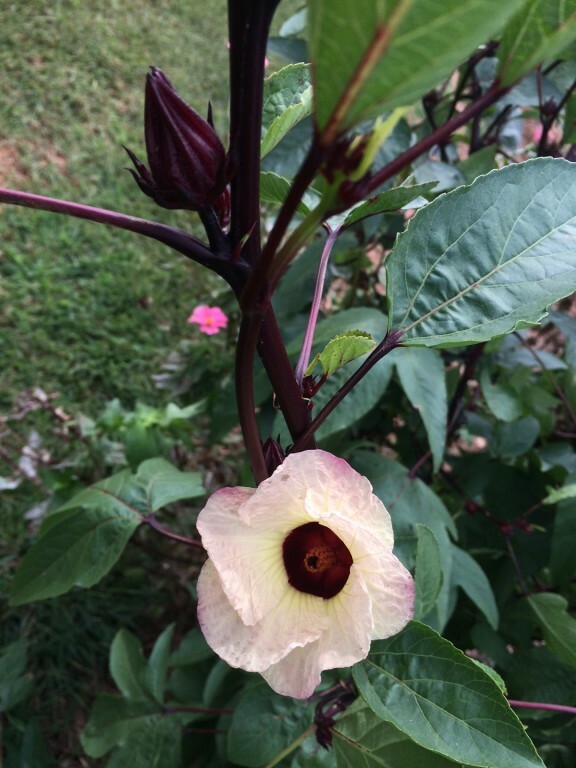 I first learned about roselle (Hibiscus sabdariffa) about a decade ago while serving as a Peace Corps volunteer in Vanuatu. I was visiting a farm on the grounds of a Catholic boarding school that grew all the food for the 700 or so students. The farm, run by an older Australian man, was a model of sustainability with alley cropping systems, rotational grazing but it was roselle and a delicious jelly that has helped keep this visit fresh in my mind to this day. After a couple hours of learning about their operation the farmer led me to one of the sections of the garden filled with an exotic red-stemmed plants full beautiful hibiscus like blooms. He shared that the calyxes of the flowers, which are almost waxy to the touch, can be used to make tea and jelly. The jelly that I sampled was amazing, it had a unique almost cranberry like taste. The plant does get rather large so make sure that you give it enough space. This one plant was about three feet wide here and got about 5-6 feet wide by the end of the growing season. 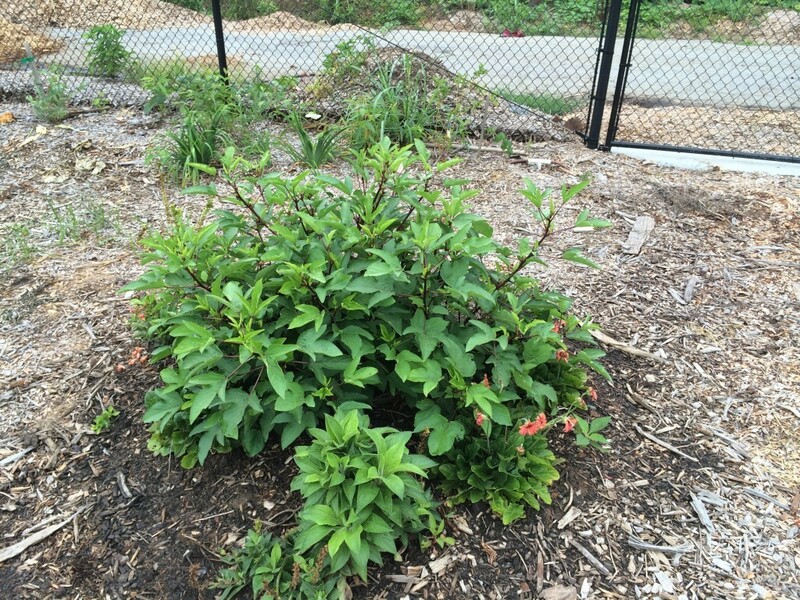 I started growing roselle myself last season after collecting some seeds from a fellow gardener. 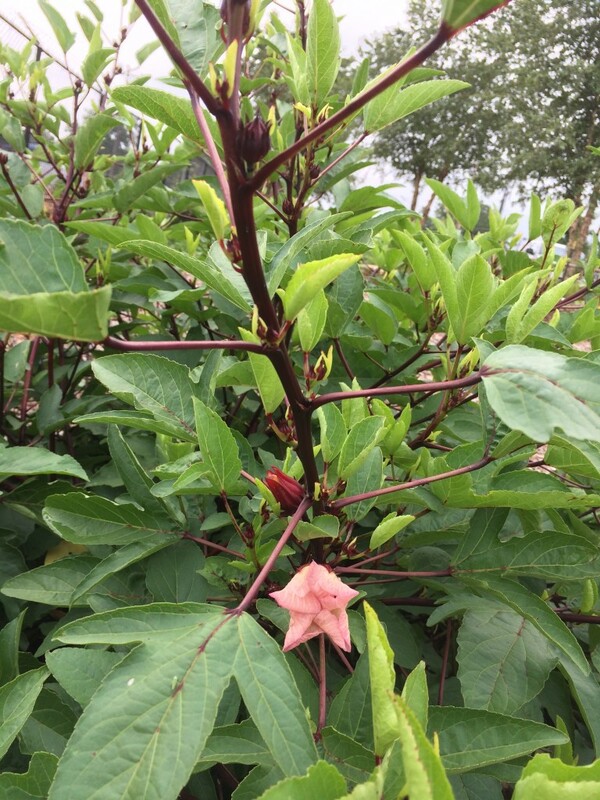 Roselle is in the mallow family of plants along with cotton and okra. Seeds must be started indoors at least 6-8 weeks before the last frost if you want to harvest the calyxes before the fall frost. If you are not as concerned about the harvest they are easy to grow from seed as long as the soil has been able to warm up. The plant itself is beautiful with deep burgundy stems and okra-like leaves with a touch of that burgundy in the midribs. 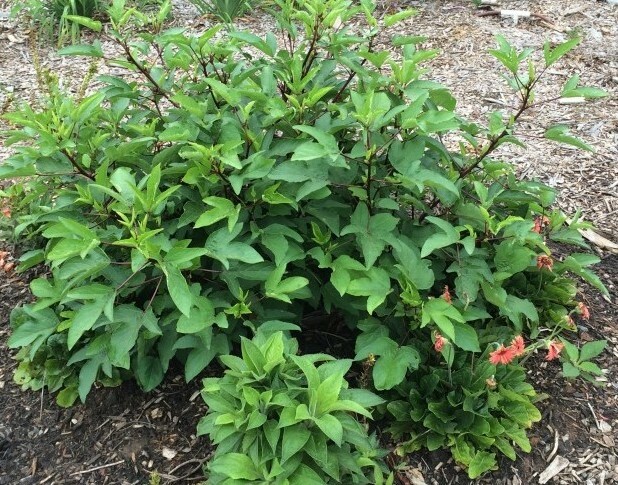 The roselle plant is a beautiful and low maintenance addition to the garden. I enjoy chewing on the calyxes fresh off the plant, they have a sharp acidic cranberry taste, the young leaves are also edible and have that same sharpness similar to a garden sorrel. This characteristic is why in some areas of the world they call the plant a sorrel, which it is not. I have loved having this plant in my life again and might try to make some of that jelly that first piqued my interest as I begin harvesting in the next week or so. If given enough time in the garden the plant will become loaded with beautiful flowers. Posted in Annual Plantings, Herbs, Home Gardening, Plant Profile. This entry was tagged Edible Hibiscus, Hibiscus, Roselle. Bookmark the permalink.